Invasions by introduced pests can interact with other disturbances to alter forests and their functions, particularly when a dominant tree species declines. 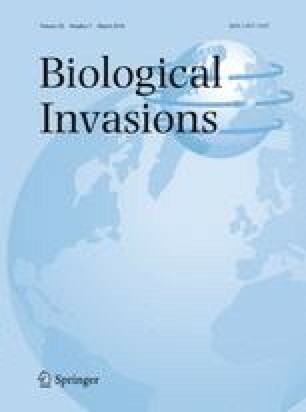 To identify changes after invasion by the insect hemlock woolly adelgid (Adelges tsugae; HWA), coinciding with severe droughts and hurricanes, this study compared tree species composition of eastern hemlock (Tsuga canadensis) forests on 11 plots before (2001) and 15 years after (2016) invasion in the southern Appalachian Mountains, USA. Losses of hemlock trees after HWA invasion were among the highest reported, with a 90% decline in density, 86% decline in basal area, and 100% mortality for individuals ≥ 60 cm in diameter. In contrast to predictions of theoretical models, deciduous tree density declined after HWA invasion, while basal area changed little, at least during the initial 15 years after invasion. Overall, forest density declined by 58%, basal area by 25%, and tree species richness by 8%. Factors additional to HWA likely exacerbating forest decline included: droughts before (1999–2001) and after HWA invasion (2006–2008); tree uprooting from hurricane-stimulated winds in 2004; pest-related declines of deciduous tree species otherwise likely benefitting from hemlock’s demise; death of deciduous trees when large hemlocks fell; and competition from aggressive understory plants including doghobble (Leucothoe fontanesiana), rosebay rhododendron (Rhododendron maximum), and Rubus spp. Models of forest change and ecosystem function should not assume that deciduous trees always increase during the first decades after HWA invasion. The online version of this article (doi: 10.1007/s10530-017-1568-0) contains supplementary material, which is available to authorized users. The 2016 remeasurement was funded by start-up funds managed by S.R. Abella and provided by the University of Nevada Las Vegas, and by funds donated by S.R. Abella via Natural Resource Conservation LLC. The 2001 data collection was supported by grants to V.B. Shelburne from the South Carolina Department of Natural Resources (SCDNR) and the U.S. Fish and Wildlife Service’s Wildlife Conservation and Restoration Program. The 2001 study was performed in partial fulfillment of the requirements for a M.Sc. for S.R. Abella at Clemson University, under advisement by V.B. Shelburne. The SCDNR and Duke Power Company provided access to establish the plots and supported the research; H. Douglass (Foothills Trail Conference), V.B. Shelburne, and D. Chastain provided helpful information on recent forest changes in the study area; S. Altman prepared the figures; and two anonymous reviewers provided helpful comments on the manuscript.